Happy New League Year! June 1st kicks off our celebration of our 95th year serving the San Antonio community, and we have a very exciting year in store. Back in August 2016, I watched a few minutes of Summer Olympics coverage that provided the spark of inspiration for our vision for this next League year. Women’s coxed 8 rowing was on live early that Saturday morning. In case you’re unfamiliar with women’s 8 rowing, it’s a team of 8 rowers led by a coxswain rowing on open water. The coxswain sits in the stern, facing the bow and the other rowers. She is responsible for steering the boat and coordinating the power and rhythm of the rowers. The US women’s coxed 8 rowing team was going for its third straight Olympic gold medal and 11th consecutive world or Olympic title. What a fantastic metaphor for the Junior League of San Antonio: those 8 women rowing, doing the hard work the way our League leaders do, with the support of the hundreds of women who serve every day on our councils and committees, and the legacy of the thousands of women who have come before us serving as the foundation of all we are able to accomplish now. We are rowing this boat toward the future, but we sit in a vessel carved by those women who have inspired us since 1924 and brought us to our 95th anniversary this year. Our team members all have their own individual strengths and talents, but the team is interdependent. We must rely on each other to get the boat across the finish line. We are stronger together. No matter what committee you are on, or what council you serve, we are all Team JLSA. No one woman alone gets that boat across the finish line – I can’t, but #WeCan. What is the identity of our “boat,” our organization? What is Team JLSA’s only goal? If I could sum up our Mission Statement in 3 words, those words would be: We change lives. It’s fairly self-evident how we do that in direct service – that part of our Mission where we “improve communities through the effective action and leadership of trained volunteers.” Our members go out to Endeavors, or Boys & Girls Club, or Girls, Inc., and we make connections with people that help brighten or improve their lives in ways small and large. Community is truly the heart of the League, and that council is staffed by amazing women giving so much not just of their time but of their hearts and souls. But when our members get a hug from a patient at Clarity Child Guidance Center, or they get a thank-you note from a Transfer member who they’ve welcomed to their new city, or they somehow pull off chairing a 5K even though they’ve got a newborn baby and ZERO running or fundraising experience (that was me! ), they feel good about themselves in a way that transforms that member. That’s the real power of the Junior League of San Antonio. Yes, we help change lives in the community, but if you open yourself up to the limitless possibilities of this experience, JLSA can change your life, too. And when we send our members out into the world, after having had great successes and accomplishments and, let’s face it, probably a couple of failures, too, within the League, those leaders have a ripple effect on the rest of our community. Many of our members have heard this question about League membership before: “Why should you pay to be a volunteer?” Well, the answer is: because you aren’t paying to be a volunteer. You’re making an investment in YOUR greatest asset – yourself – and joining the finest team of women in San Antonio. The training and experiences that are available through JLSA are not available at any other organization in this city. This is a wholly unique institution, and when our women open themselves up to it, they can grow into their fullest potential and go out and change the community – maybe even beyond the borders of San Antonio. Yes, there are other young professional organizations, but none of them are actively encouraging women of all ages from all different types of backgrounds to work together and support each other the way JLSA does. We have stay-at-home moms and work-from-home moms and single professional women and working women with families and even retired women among our Active membership ranks – and you won’t find that just anywhere. I believe the empowerment and development of women, the support we provide each other, and the friendships we develop here are among the most important offerings of our organization. We are all strong, amazing women with different talents and skills, but we are all JLSA. Selfishly, I’ve been the beneficiary of the full potential of JLSA. When I joined this organization, I was 6 months removed from the hardest, lowest point of my life – after 3 years of suffering from acute depression and PTSD after being shot in a random act of violence in 2008, my dad took his own life on November 14, 2011. Up until that point, I had been a litigator, traveling multiple days a week and working unsustainable hours. 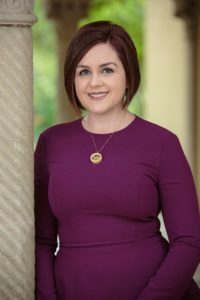 But I also had a baby girl who was a week shy of 5 months old, and when I looked at her, I thought, “Life is way too short to be doing a job that’s making me miserable.” I walked away from practicing law, and though I loved being home with my daughter, I did very quickly feel like something was missing in my life – something that fulfilled me outside my role as Cora’s mom. I needed something where I felt seen and appreciated for my own talents and strengths. My best friend was in the middle of her New Member year with JLSA, and she really thought that it would be a good fit for me. I threw myself into the New Member experience. I took chances in JLSA that I never would have taken otherwise, and I learned all kinds of new skills – volunteer management, making the ask of a donor, planning and executing events. For 6 years, including through pregnancy and the birth of a second child, I wasn’t working outside the home, but as my husband said, I was a “professional volunteer.” Fast forward to a breakfast last August with the Vice President of Alumni Relations & Development at my alma mater, where he suggested that I apply for a job in Alumni Relations that was going to be opening up soon. Going back to work wasn’t on my radar at all, but sometimes, you just have to take a chance on yourself, the way I did when I decided to join JLSA 6 ½ years ago. I decided to apply for the position. To make a long story short: I got that job, and it was all because of the 6-year “gap” in my résumé that was actually filled with new experiences and new challenges in the Junior League that made me a competitive candidate for the position. Despite my fears about adding a full-time job to my plate, as it turns out, JLSA can fit into even the busiest life. It’s a balancing act, but we make time for the things that matter most to us and bring us fulfillment – for me, JLSA is one of those things. I could not be embarking on this journey without the support of my family. I am grateful to have a husband who loves and supports me and is better at bedtime with the kids than I am now. My kids don’t quite know what all these meetings Mommy goes to are about, but when I tell my daughter she can be the President of the Junior League someday too, she tells me she wants to be the President of the WHOLE UNITED STATES. That’s exactly the message I’m trying to impart, that there is no ceiling for women’s potential, and I hope she would still have that confidence even if I weren’t trying to set this example. As excited as I am about this experience, and as much as it means to me, there’s an empty seat in the figurative front row where my family is sitting. I don’t know exactly what my dad would say if he were here, but he sent me an email when I first moved back to San Antonio in 2009 and was looking for a job where he said, “there must be lots of places in a city as large as SA where your abundant talent, personality, etc would be appreciated.” Turns out I found one of those places right here in the Junior League. To all my fellow members, thank you for selecting me for this placement. Just like every one of you has a placement for next year, my placement happens to be President – I am still a JLSA member first. Thank you for making this continued investment in yourself and in your community. You are paving the way for women you’ve never met before and who you are benefiting and influencing right now, though you and they might not realize it yet. I am so excited about what we’re going to accomplish over the course of the next 12 months and beyond, and I am honored to be serving alongside and at the pleasure of 1,100 of the finest women leaders in San Antonio. To the community, thank you for supporting our efforts through fundraisers and events for the past 95 years. We can’t do what we do without the full support of our fellow San Antonio citizens, and we hope to see you out and about this year as well! To all women leaders, in the next year, be relentless with your curiosity. Be unapologetic with your passion. Use your voice boldly. Show a fearless, daring spirit. Stand out prominently. Together, we are unstoppable. Together, #WeCan. Are you ready?